Few people can claim 70-plus acres of land as their office. Fewer still hold the title of plant whisperer. 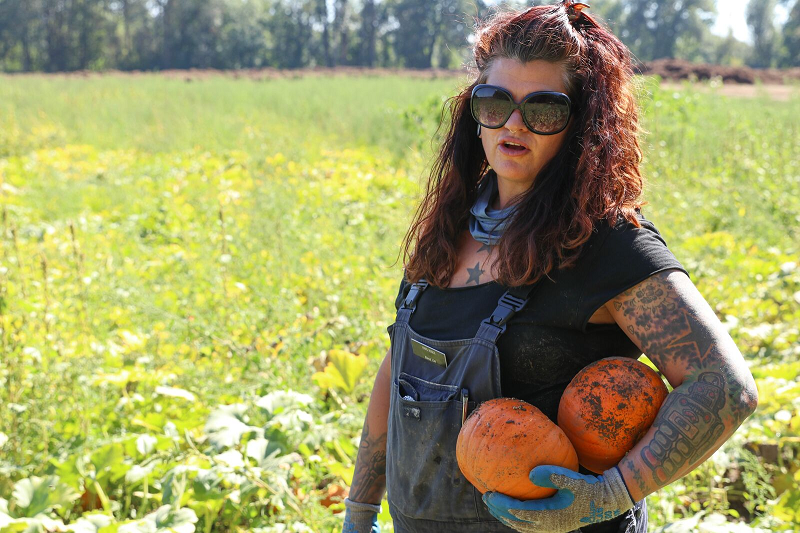 Both are true for Stacia McAlpine of Rogue Farms in Independence, Oregon. McAlpine works the fields that are home to many of the ingredients that find their way into Rogue’s beers, spirits, ciders and sodas. While the majority of those 70-plus acres is dedicated to growing hops, McAlpine oversees the remaining acres that abound with lavender, star anise, raspberries, cucumbers, pumpkins and even two potbellied pigs named Voo and Doo. But as McAlpine talks about the varieties of herbs, fruits and vegetables under her care, it’s clear she holds the 2 acres of marionberries in especially high regard. The marionberries are truly a labor of love for McAlpine, who with a team of 20 people handpicked 16,000 pounds of marionberries working every day for a month’s time. And after that, McAlpine still had to cut out the old vines and train the new onto wires. Rogue tapped a marionberry sour this year that sold out almost immediately, McAlpine says. Like most farmers, McAlpine’s day depends on the time of year. In winter, she spends her time on repair, maintenance and preparation—on getting plants under lights so that, come spring, she can get the gardens going again. And, like most farmers, her days are sometimes at the mercy of Mother Nature. The farm is nestled along the Willamette River, and flooding occurs nearly every year. It can actually be a welcome sign for McAlpine, as the flood brings in silt that helps enrich the fields. Yet while hops can thrive, those prized marionberries don’t take well to the flooding. They got devastated a couple of years ago. This year, McAlpine had to wear a respirator in the field due to smoke from wildfires in Oregon. In addition to causing chaos in the field, Mother Nature can wreak havoc as well in the brewery, where there’s a set production schedule and brewers waiting on McAlpine’s ingredients. All three of those are staples for McAlpine, who grows at least an acre of cucumbers a year. The resulting crop is used in Rogue’s cucumber citrus soda, as well as the company’s gin. Pumpkins take up 8 acres and are used in Rogue’s Pumpkin Patch Ale, and the hazelnuts are used in both the Hazelnut Brown Nectar and Hazelutely Choctabulous (which is a blend of Hazelnut Brown Nectar and Chocolate Stout). Staples aside, what McAlpine grows depends largely on what Rogue plans to use for beers, spirits, ciders and sodas in the coming year. Last year, she planted an acre of peppers for the brewery’s Chipotle Ale. She also takes requests from the brewers and distillers, and she’ll decide on her own to grow ingredients—raspberries, gooseberries and currants, for example—that she thinks would go well in a Rogue beverage. She grew “a ton of lavender” this year thinking it might find its way into a soda or Belgian-style beer. “I get to grow wonderful things and hope that the brewers want to brew with it,” she says. One of McAlpine’s favorite places on the farm is a quarter-acre experimental garden. Rogue Farms does have room to expand, says McAlpine, and she would like to add in more fruit trees—apples, pears and nectarines to start. More nuts, too, and she is interested in growing more botanicals, or finding ways to grow more of the staples that the brewery needs. She doesn’t always get a chance to taste the fruits of her labor in the finished product, but the Pumpkin Patch Ale holds a special place in McAlpine’s heart, and she also enjoys the brewery’s 7 Hop IPA, all of the hops for which are grown at Rogue Farms. Among the farms, the brewery and the distillery, Rogue employs no small number of people. Despite the physical nature of her work and the challenges from Mother Nature, McAlpine thinks there is no better profession in all of Rogue than her own. Marion Berry > marionberries …homage to a crack-head? Love to try a few. What’s the fruit bearing season? Plan to be out there from Maine where I live at some point, might as well co-incide with berries. I envy your job. Sounds a lot like Heaven on Earth. You doubtless do it well.